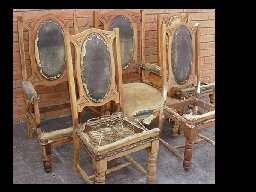 A complete range of restoration, conservation and repair of furniture is available using traditional materials and techniques. 1950's 3 piece couch re upholstered in red and ivory leather. 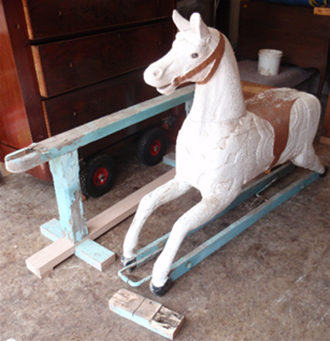 This box was sent to us from interstate (Queensland). A major exercise to restore! Some of the intricate brass work was missing so we had to make some up and fit it. 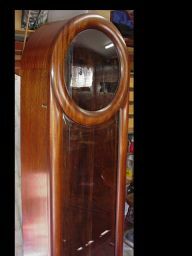 We also had to repair damaged and missing veneer pieces as well as releather the interior. 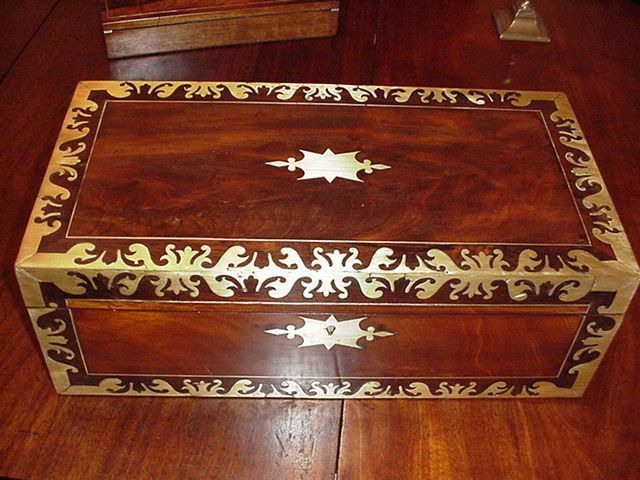 The surface was carefully cleaned and re polished and brass work was also cleaned. 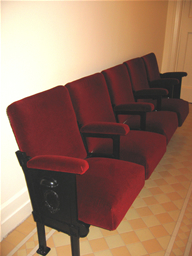 Theatre seats from an old theatre in Geelong. Metal work cleaned and powdercoated and re upholstered in rich red velvet. 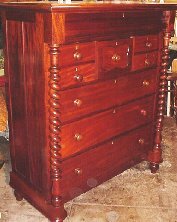 Secured to a plank of solid African Mahogany which was French polished and wax polished. Victorian cast iron and brass bed. 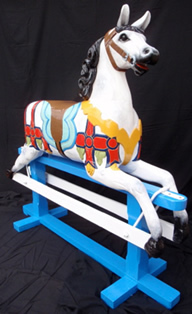 Brass repaired (dints removed), missing pieces were made up, brasswork polished, cast iron repainted. 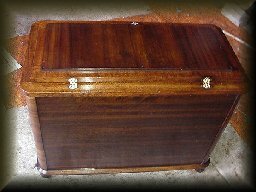 Old trunk. New brass was fitted where missing, stripped and polished. Cabinets at the necropolis (springvale cemetery). Brasswork polished, interiors re lined, timber re polished, chairs re upholstered, gas struts fitted to glass. The before picture shows the opaque pigment which had been applied at some stage which does not allow the grain to show through. We removed the pigment which allowed for clarity. 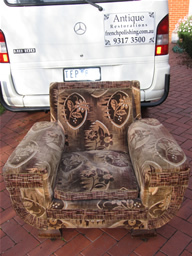 This Jacobean lounge suite had seen better days. 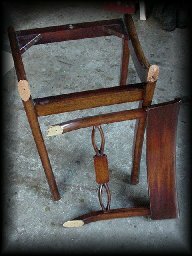 One of the arm chairs needed to be pulled apart and re glued. The entire suite was French polished and the upholstery was re done on a micro suede fabric. It now resides in a young barristers chambers. A magnificent cedar staircase well over 100 years old in Kew. A dark opaque finish had been applied at some point which looked dreadful. We carefully removed the finish without compromising the patina. 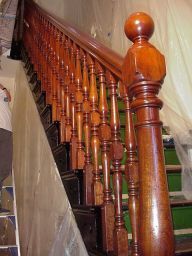 There was no need to stain because the timber had a beautiful natural color . We discovered a handful of balusters had been replaced with pine ones and we suspect this was the reason for the dark pigment stain throughout (trying to disguise the pine). So we replaced the pine with new cedar ones that we "aged" before re fitting. 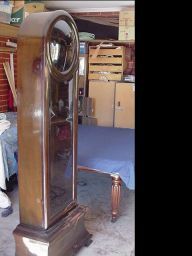 We then French polished and wax finished. Sides of the steps were black japanned. 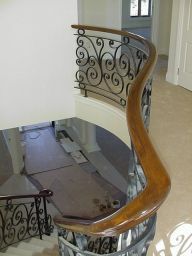 A modern staircase made from Vic ash and wrought iron. There are no "before" photos. The timber was raw when we started. 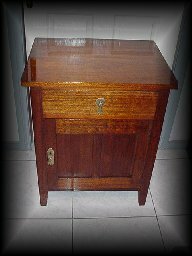 It was sanded, stained and French Polished. 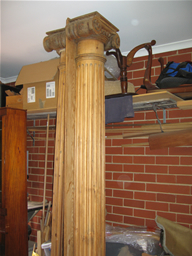 Pair of ionic columns. French polished and wax finished. 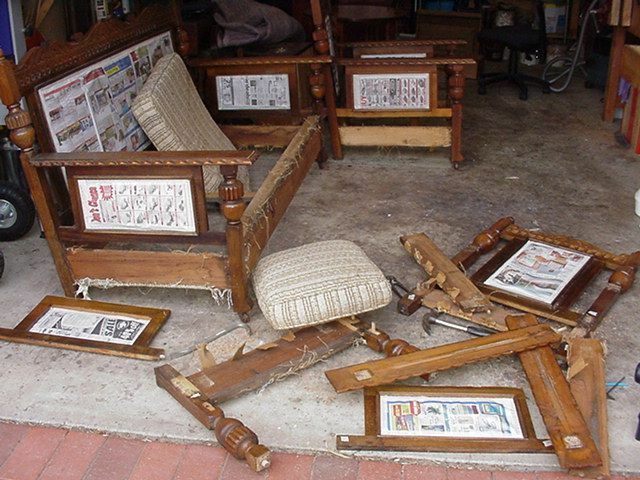 Another example of some of the terrible things people do to furniture. 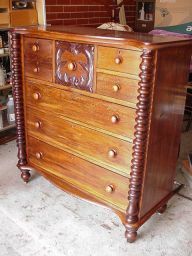 The stain/polish which had been applied did not allow the beauty of the timber to be seen. New hand coloured leather fitted to top. Although new, it looks 100 years old. This makes a nice change from the Green's and Burgundy's. 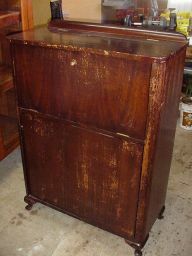 We stripped and re polished it and then wax polished it for a lovely deep sheen. The colour of these bathroom cupboard doors was too light for the owners so we stripped them, stained them darker, French polished and wax finished them. They now want their kitchen cupboard doors done the same way. This clock was damaged in transit and was sent to the clockmaker to repair the movement. The clockmaker sent the jigsaw puzzle to us. 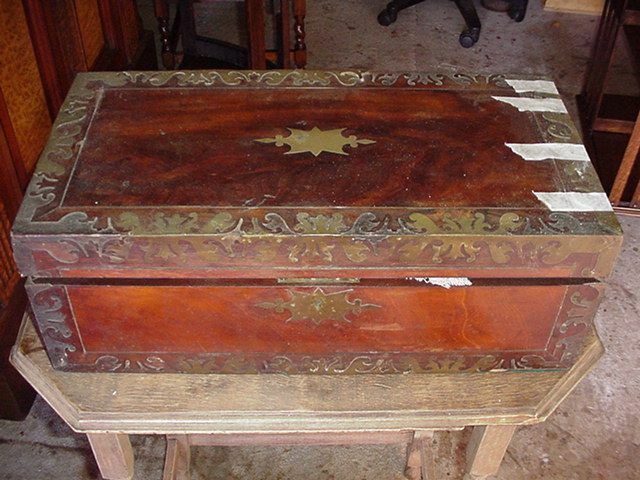 We reglued the pieces which could be reused and carved new pieces where the damage was too great. Patches were coloured to match and the entire clock was French Polished. Candle sconces were added after repolishing which gave the piano a whole new look. 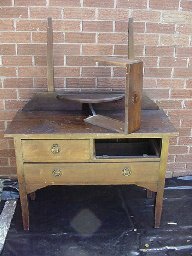 This dressing table was rescued from a garage. It was missing part of the drawer and was very tired looking. 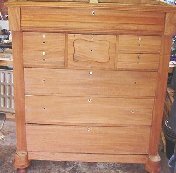 We made new pieces for the drawer, complete with dovetails and repolished it. In our haste to commence this project we forgot to take the 'before' pictures. They had a very dark brown/black pigment painted on them and looked rather ordinary. The owner of this lovely Victorian home in Fitzroy Melbourne, stripped the old surface which gave us a clean palette to work with. 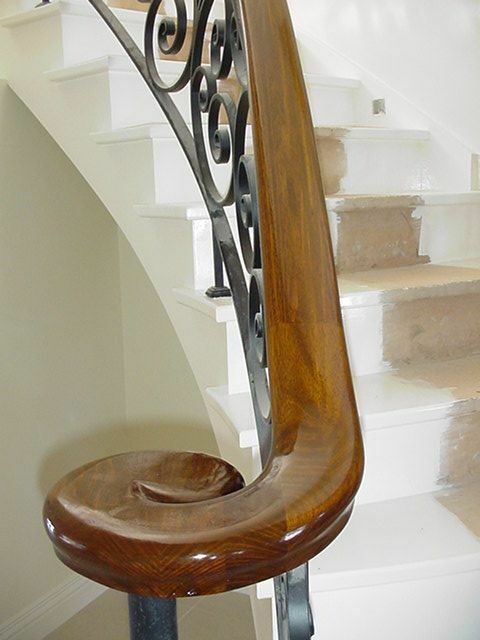 We selectively stained the hand rails and posts and then French Polished them. We then gave them a wax finish to eliminate some of shine which is prevalent with shellac. 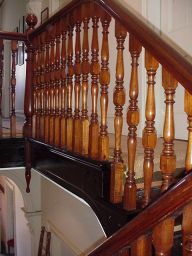 The balusters were then painted ivory and edges japanned. 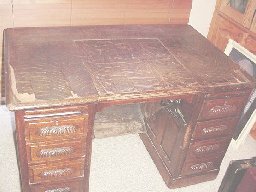 The oak veneer on this desk was lifting and there was far too much missing to allow for 'patches' to be fitted. We sourced some oak veneer with fairly prominent medullary rays (the yellow bands or flicks running across the grain) and replaced the top. 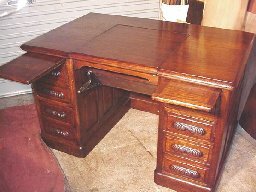 The entire desk including the slide out boards were stripped, stained and French polished. At some stage someone thought it would be a great idea to paint this beautiful table mission brown and then keep it in a chook pen. The owner had no idea what beautiful timber would be found underneath. We removed the brown paint as well as the bird droppings! and repolished it. The owner of this wardrobe wanted a display cabinet. We made some custom modifications and converted into a glass display case with mirrors and adjustable glass shelves. 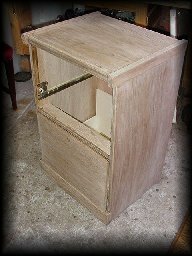 The Oak timber case was French polished and wax finished inside and out. 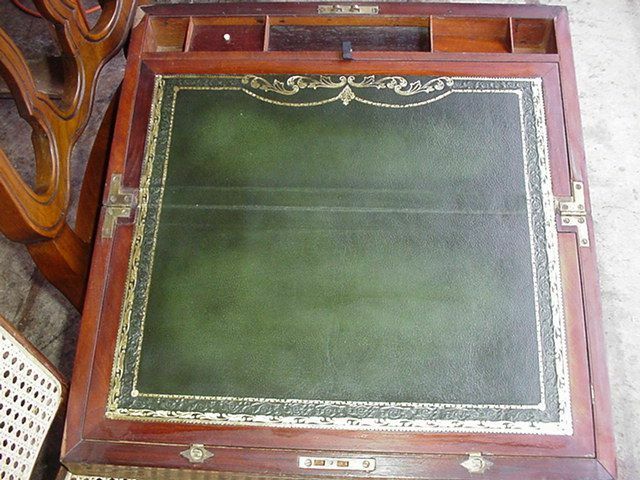 Not only was the surface in need of repolishing but it was also missing pieces of the fretwork. 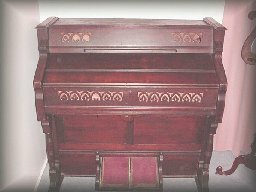 New pieces were carved and the organ was repolished. 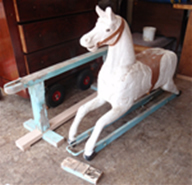 A complete restoration job. 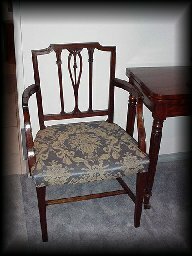 Reupholstered and French Polished. 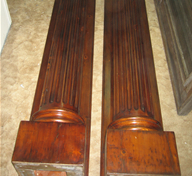 The timber was all stripped, then stained, french polished and waxed. 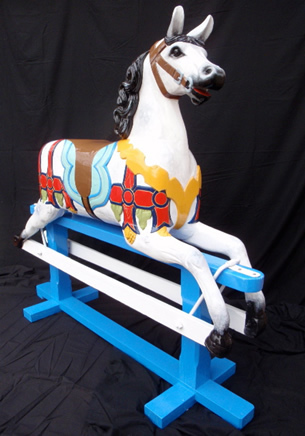 The metal was cleaned up and repainted and brand name highlights were regilded. This came to us already stripped. We stained it, french polished it and then waxed it. This is the result of leaning back on a chair. A fairly nasty break. 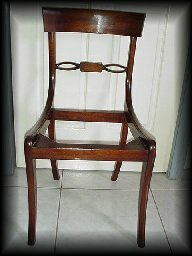 The chair was glued back together and the repair was carefully concealed to hide the repair. 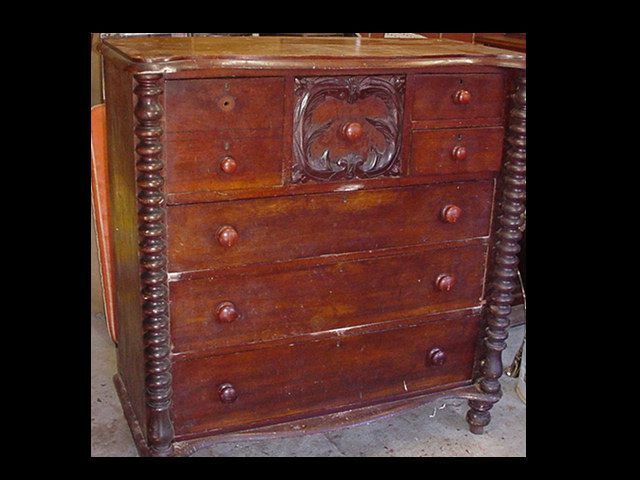 Although it is not visible, the draw runners were all well worn which meant the drawers would not slide easily. Runners were replaced and exterior was french polished and waxed. A picture says a thousand words. We don't usually like to sand the finish on an antique in order to preserve its patina. On this occasion we had no choice. 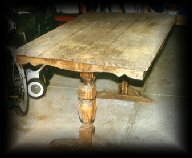 The oil stains and burns were removed, the table was stained, french polished and waxed. 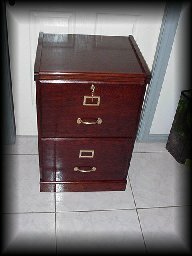 Finally, drawers were made to replace the ones that were missing. In obvious need of some tender loving care. 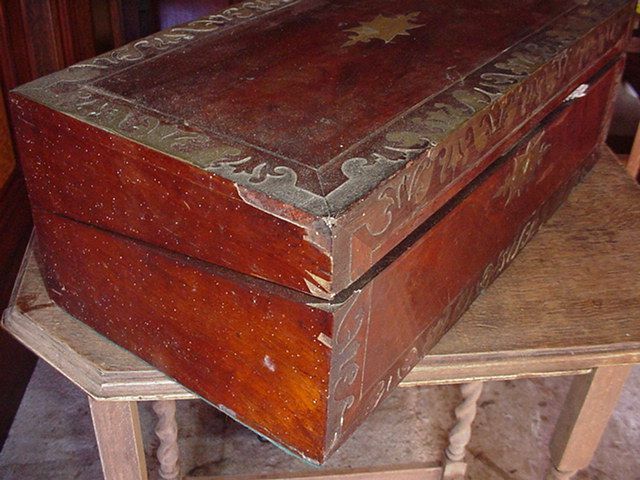 Carvings and highlights were gilded in gold leaf, exposed timber was re-coloured and french polished. 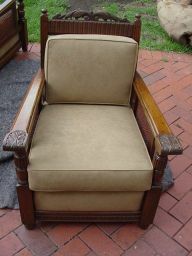 Upholstery completed the job. 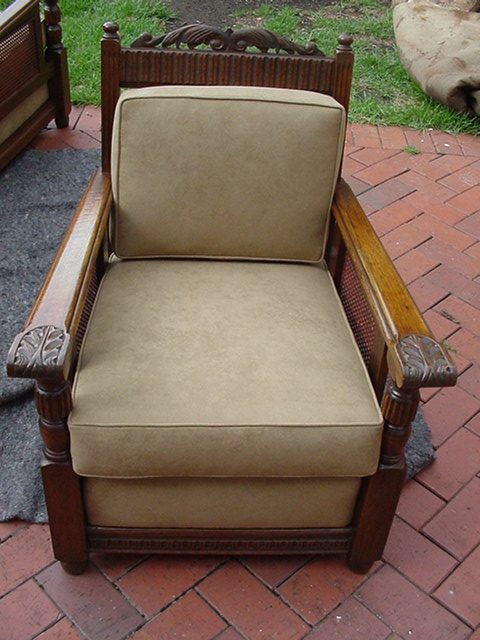 This chair had a broken arm and borer had caused substantial damage to the seat rails. 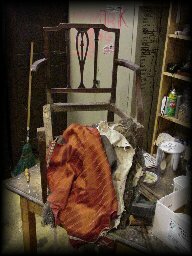 Borer was exterminated, seat rails were repaired, chair was polished, waxed and upholstered. Stripped, stained, polished and waxed. 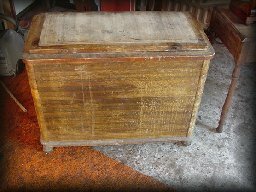 This table was pulled out of a garage where it had been used as a work bench for 30 years. The legs were completely rotten and there were parts missing such as the bottom stretcher and carvings on the legs. A block of wood was glued to the missing area and re-carved to match the rest. New legs were made and then aged to look like the rest of the table. 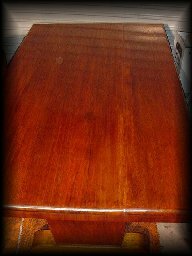 The entire table was stained, polished and waxed. This was brought to us by a young lady who brought it brand new but didn't like the finish. 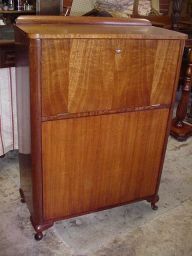 We removed the 'modern' finish and french polished it. She now loves it. The owner of this clock had a friend who tried to restore it for them and applied a stain which had both green and red in it. It looked like plastic. We stripped it, stained it, French Polished it and wax polished it.